"Geery Howe's latest book Working Through the Trough of Chaos could not have come at a better time. In these uncertain and constantly changing times, Geery reminds us that sound leadership, strategic understanding and most importantly execution are key to guiding our organizations. This book is a great "road map" for all leaders to use as they work through the various stages of strategic change. Geery's storytelling and real life examples helped me understand that chaos is not something to fear within our organization but can actually "become our friend". This is a book you will reference often." "I found Geery Howe's work in the book, Working through the Trough of Chaos very appropriate reading for the leaders in our organization. As a company in the midst of tremendous growth, these were the starting-point concepts for the discussions we had with Geery. I think the most important concept for our organization was to accept chaos is inevitable in a period of great growth and our challenges reside with understanding it and leading through it. The book made a great impact with many of our senior managers." "Leading people to the "Trough of Chaos" is a choice we make every day as leaders with the vision and plans to grow an organization or an individual. Like "leading a horse to the trough for water… you can't make him drink." Choosing to develop an organization or an individual requires their willingness to drink, understand and accept the potential chaos of change. 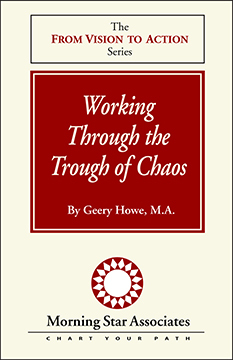 Geery Howe's booklet, "Working Through the Trough of Chaos" helps bring to all of us as leaders, the critical reminders and tools for developing organizational and individual willingness, understanding and acceptance of the chaos that comes with change. ... He provides very clear direction on the leadership that needs to take place to ensure chaos is part of a growth strategy and not a distraction that can stifle an organization. Howe challenges leaders to look hard internally and externally; to define organizational strengths and weaknesses before leading everyone to drink at the trough. Geery also helps leaders identify the stages organizations and individuals move through as they enter in and come out of the trough of chaos, reminding us that not every individual moves through the trough at the same pace of understanding and commitment. Howe also reminds us of the critical role the leader plays in communications. Answering the question why over and over, with laser beam clarity is so very critical. Geery provides excellent ideas and suggestions for improving strategic communications. This booklet, along with Howe's other writings, don't sit on my shelf, but on my desk, close to my keyboard, with post-it-notes tabbing pages and paper clips marking ideas and reminders that need to be incorporated into our strategic implementation processes. Right now, The Trough of Chaos is on the top-close to my keyboard. As leaders we are working diligently to make sure all chaos is constructive and controllable resulting in steps towards the vision we have articulated for our organizations and not distracting from the organizational focus. Geery's booklet can help us successfully do that... and keep the Trough of Chaos as shallow as possible!" "Geery Howe, in Working through the Trough of Chaos, has captured the essence of how an organization must navigate through three sigmoid curves, the Present, the Future One and Future Two and all three sigmoid curves simultaneously. I have sat in Geery's class sessions in his leadership training program, the "From Vision to Action Leadership Training." He masterfully brings in the concepts of many authors and weaves them into his own story of how leadership must have a strategic framework with commitment and execution. In his latest book, he is definitely a consummate professional, giving his readers a detailed account of how individuals and organizations go through the trough of chaos to develop a high performance organization. This is must reading for any leader, intending to meet the challenges of the 21st century through leadership action of supporting, participating and collaborating to take his or her organization in building a performance management system." APPA Fellow and APPA President 2006-2007, is Associate Vice President for Facilities at Iowa State University. He also is the author of Manual for Selection of Design Consultant (CFM 1981), Leadership in Educational Facilities Administration (APPA 2007), and Customer-Driven Operations Management: Aligning Business Process and Quality Tools to Create Operational Effectiveness in Your Company (McGraw-Hill 2009). "The morning light was pouring into the conference room as we all gathered for the first meeting on how to build an effective performance-management system. I sat down in a chair in the middle of the long conference table and put my briefcase in the chair next to me. Pulling out my blue notebook with pre-meeting notes and a manila file folder with key information on the organization, I looked up to see two women executives walk into the room. One was a woman I had worked with for quite a few years, and the other was a new person who was attending her first management-level meeting. I arose from my chair, greeted them, and introductions were made. By then, everyone else had come into the room, so we sat back down and began the meeting. Our time together that morning opened with an in-depth examination of the internal and external trends and conditions that were causing the organization to want to develop a new and more effective performance-management system. Once this strategic- level review had taken place, we all realized how important our work was going to be that morning. Then, the person who was running the meeting and the one who had invited me to come asked for my perspective. First, I explained how to design a new performance-management system and what the keys to success were in the design process. Next, I explained two to three different ways to implement such a system. Finally, I concluded my opening remarks by explaining that a new performance-management system was going to lead people into a six- to nine-month "Trough of Chaos." I had barely finished my last statement when an audible gasp was heard across the table from me. This came from the woman who was new to management, by this time a bit wide eyed. With a touch of panic in her voice, she asked, "The trough of what? Six to nine months of chaos? Are you kidding?" Her boss, with whom I had worked for quite a few years, leaned over, touched her arm, and said, "I haven't shared that with you yet. We didn't want to scare you straight out of the box." I smiled and thought to myself: commitment without understanding -- a common leadership problem. And then we dove into a discussion on what actually happens in the Trough of Chaos. Years earlier, I had learned the importance of unifying commitment and understanding. Back then, I was working with a small, rural health-care facility struggling with constant problems and persistent turnover issues. The new CEO had called me in "to help rebuild the foundation for success." After a series of meetings with senior management and department heads, I presented my analysis that the organization was trapped in a paradigm paralysis-- which was resulting in a continual Trough of Chaos. I explained that this was a normal stage of organizational development that with time, patience, and understanding could be transformed. I remember one young department head raising his hand and asking, "So how can we fix all this stuff that is getting in the way of our productivity?" I responded that, from my vantage point, many problems in the Trough of Chaos are leadership problems related to the lack of strategic understanding and execution. As I pointed out to him that afternoon, there are two myths in leadership during change. First, many leaders think their job is to come up with all of the answers and expect that they can solve all of the problems. Second, many leaders think it is their job is to tell everyone else what to do so they can prevent all problems, or at least not create any more problems. But, as a wonderful Wisconsin executive recently told me, "You can't fix dumb." Commitment without understanding of how to move through the Trough of Chaos does not yield improved results. Having been involved in this work for over 20 years, I have learned that during every organizational change cycle there is a normal period of time which is challenging, complex, and difficult. I call it the "Trough of Chaos." During this six- to nine-month period, people must learn to let go of a previous system, organizational culture, or definition of success, and embrace a new way of working and thinking. It is hard work for employees and executives. But with time, patience, and understanding, it is not only doable but possible to yield significant results that will create both short- and long-term momentum. The key in the beginning is to understand that the Trough of Chaos is a normal phase of development. There is no need to panic and there is no reason to "fix" it. Instead, we as leaders need to help people move through these normal stages within this challenging time period. In this particular booklet, Working Through The Trough of Chaos, we will begin by examining the greater journey through organizational change, a typical 18-month, sigmoid-curve cycle. Once we understand this entire cycle, we will review the four different stages people go through in the Trough of Chaos: namely, preservation, loss, discovery, and commitment. Next, we will focus on what leaders do to help people through the Trough of Chaos by examining in detail the following four leadership strategies: focusing, dialogue, building, and empowerment. Once we understand the relationship between the stages within the Trough of Chaos and the leadership strategies required to keep people moving along through it, we will explore how successful companies are working on three different Sigmoid Curves at the same time: namely, the Present Curve, the Future Curve #1, and the Future Curve #2. Finally, we will delve into a series of strategic solutions to organizational chaos and leadership solutions to chaos. Many years ago, I gave an all-day workshop to management and nursing executives from hospitals, nursing homes, and allied health-care organizations in the Midwest. In the middle of my morning presentation, I stated that leaders routinely and consciously create chaos. There was a brief pause in the room as my comments sank in, and then near total pandemonium broke out amongst the participants. Hands flew up into the air with questions. Many people turned to the people next to them and started talking. The notion that an executive would seek to disrupt order and predictability was seen as wildly absurd or complete madness. At this point in the learning journey, I reviewed with them the first Law of Leadership and Change called The Law of Chaos which states: The world does not change through balance, order, and security, but only through chaos. Once those gathered realized that when seeking to improve strategy, systems, structure, or culture within an organization, everyone involved must move from a work pattern that has a normal pattern of balance, order, and security, through a period of chaos where people choose to, or by circumstances over which they have no control, let go of the old way of working. Once they have moved through this Trough of Chaos, they will enter into a new way of working together. When those gathered recognized that chaos is a normal period of organizational change, the palpable tension in the room subsided and we moved forward. During the morning wrap-up, one young nursing executive pointed out that we should see that "Chaos is our friend." Many years later now, her comment is still one of my most favorite quotes. When commitment and understanding about the world of leadership and strategic change come together, great leaders and their organizations can engage all employees and offer exceptional customer service. Chaos becomes our friend. With this in mind, I invite you to join with me as we work through the Trough of Chaos on our continued journey to transform vision into action.